Visible Proofs: Forensic Views of the Body: Galleries: Cases: Could X-rays Have Saved President William McKinley? At the 1901 Pan-American Exposition in Buffalo, New York, an assassin shot President William McKinley twice at close range with a .32 caliber revolver. 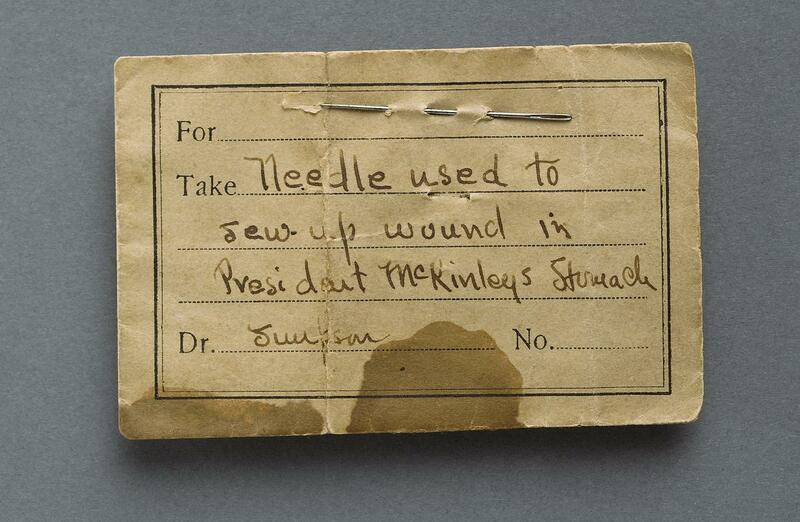 One bullet grazed McKinley's sternum (breastbone) and another penetrated his stomach. A hastily assembled medical team, headed by a gynecological surgeon, operated immediately at the small Exposition hospital, but the second bullet could not be found. 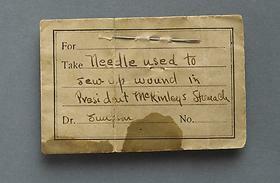 After cleaning the stomach cavity, the surgeon closed the incision with black silk thread and a straight sewing needle. A worried McKinley aide sent word to inventor Thomas Edison to rush an X-ray machine to Buffalo to find the stray bullet. It arrived but wasn't used. The medical team reported that the president was improving. McKinley's family, Congress, and the public believed he was going to recover. Instead, he died the morning of September 14. At the autopsy, physicians found that the unrecovered bullet did not cause the death of the President through loss of blood and resultant shock. Instead, gangrene had developed along the path of the bullet, and McKinley died of septic shock due to bacterial infection.